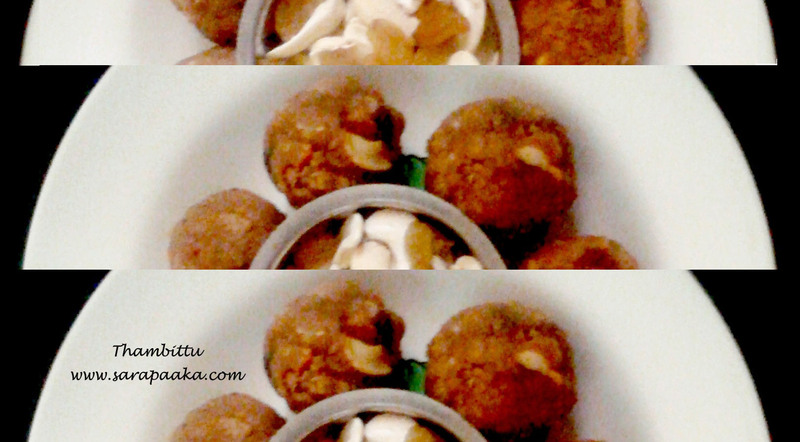 Light brown coloured laddu (ball shaped Indian sweet), daintily dotted by cashews and raisins, its soft appearance adorably spoilt by strands of dry coconut gratings. Popular prasadam dish especially in South Karnataka. Makes its way into many homes as part of “Exchange Programme” customary to festival rituals. Its consistency can be described as a cross between typical laddu and halwa. Fat content minimal when compared to “desserts” in general. Dish sweetened by…. A wonderful, delicious, blood purifying and cleansing agent, enemy of anaemia, gives cool company during hot summers, makes your skin flawless, lovely and charming. Hello to this healthy darling called Jaggery, which blends beautifully with wheat flour and transforms into rolls that make you rock! Heat 1 tbsp of ghee in a small kadai. Fry cashew pieces in it till golden brown. Also fry raisins. Switch off the flame. Keep them aside. Heat 1 tbsp of ghee in a medium sized pan. Roast wheat flour in it on low flame, slowly till the raw smell disappears and you feel the fragrance of the roasted flour. Caution: Do not over roast the flour! When done (4 to 5 min. approx. ), the flour changes colour to light brown. Switch off the flame, transfer the flour to a bowl and keep aside. Pour water on to a kadai. Add grated jaggery to it. Stir continuously till it dissolves completely. Now add grated fresh coconut, cardamom powder, fried raisins and cashews. Also add rest of the ghee. When the syrup starts boiling, add roasted flour slowly and stir continuously till it forms a unified mass without any lumps. Cover the pan with a lid and let the mixture get cooked for another 4 to 5 min. Maintain the low flame all through. Switch off the flame. Let it cool for about 15 min. Then grease your palms with ghee, take a handful of the mixture and roll it either into balls or flatten them as patties. Garnish with dessicated dry coconut if you wish. Arrange them on a flat plate and keep it open for about an hour. Store them in an air tight container. It remains fresh for a day or two. It stays for about a week if stored in the fridge. In case the mixture appears very dry, sprinkle a few drops of water. Mix well and let it cook for another minute or so. If it appears watery, let it steam off. However, this adjustment is possible only if the margin of error with respect to water: flour ratio (1: 2) is negligible. Thambittu can also be prepared using rice flour / roasted gram flour.